My friend Susanne can be very persuasive. We’re friends through the Rapid Wheelmen, our bicycle club, and share a love of bikes, beer, and camping. Plus, she’s German, my mom was German, and I can cook her a meal that would be recognizable in her home country, while throwing about a few choice words in her native language. 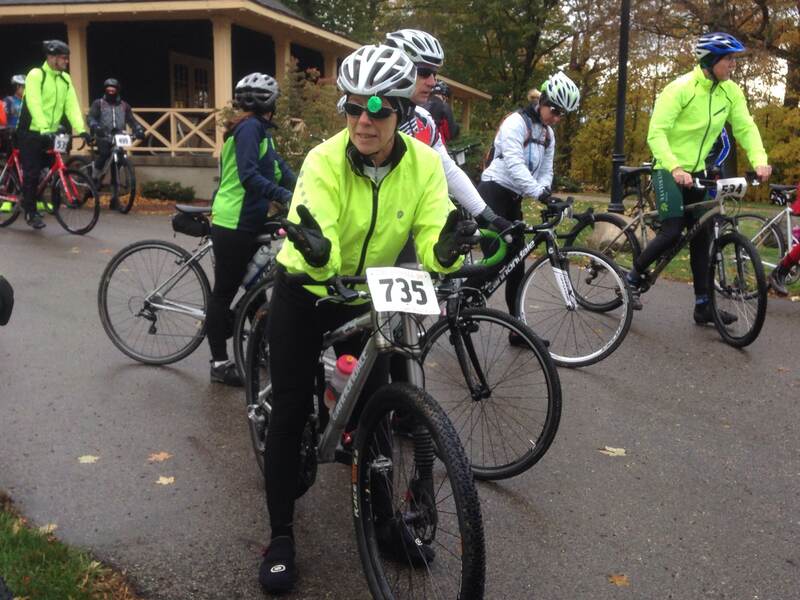 Susanne decided to make it her mission to entice me to register for the Lowell 50, a gravel road bicycle race. She bombarded me with emails and texts. Sucker that I am, I succumbed, then fretted about actually having to ride the ride. Race day (yesterday) arrived, and could not have had a more ominous start. Rain was pounding on the bedroom window and the wind was howling. Great day for a bike ride. I’m thinking that perhaps if I actually go and ride the ride, nobody else will show up, and I can grab a podium spot (one of the first three riders in each category. My category was women, 50+). Wrong! There were plenty of riders there. Cut to the chase. Lots of Rapid Wheelmen jerseys in sight at the race beginning. Most of us had elected to ride the 34 mile course, as opposed to the 50 miles (good thing, or I would probably STILL be trying to finish). Susanne’s there on her brand-new mountain bike – I’ve got my trusty Cannondale Caffeine Lefty. For the past six weeks, I’ve done nothing but a little scenic touring – no big accumulation of miles, the slow kind of stop-and-go riding that one does when seeing sights in a new location. Haven’t even had my bike out of the garage for the week we’ve been home. On the plus side, I had fresh (not tired) legs. Underestimating the length of time that it would take me to complete the race, I didn’t take any food with me. With about eight miles to go, I was totally bonked. Cramping legs were killing me, and I really thought I was going to have to get off the bike. One damn hill after another forced me to a crawl. The rain-softened gravel roads were slow – in some places like churning over new cement. Only the thought of crossing the line in front of Susanne kept me rolling. Tried to “sprint” into the finish line, which must have looked pretty pathetic. Splattered with mud, cramping, and happy to be finished. End of the day…..I did beat Susanne, although she claims to have missed a turn which caused her to ride a few extra miles. Finished 4th of 6 in my category. Looking older and dirtier at the end of the race. Think I’m ‘retiring’ from the racing circuit. It’s too much like work. 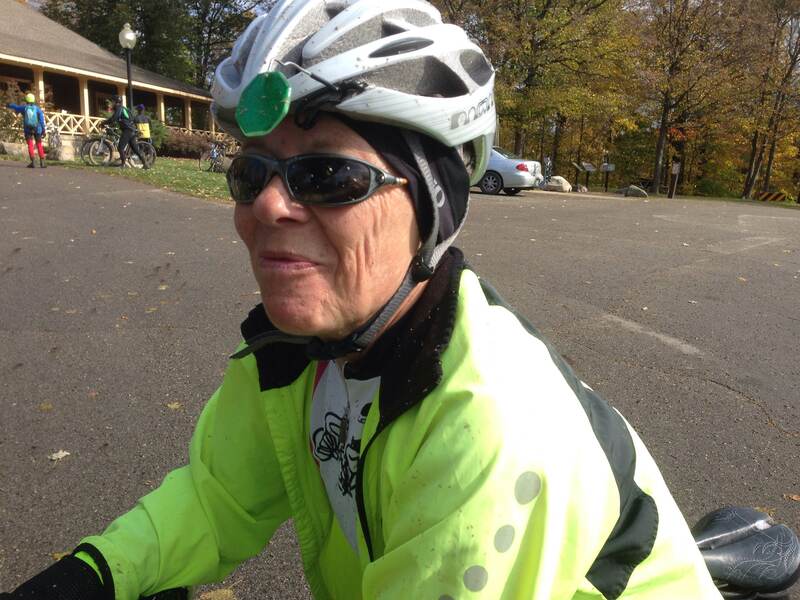 This entry was posted in beer, cycling, Michigan, retirement and tagged cycling, retirement, the great outdoors, weather by Judy Crankshaw. Bookmark the permalink. Congratulations on finishing 4th! The only way that I would have been able to cross the finish line would have been in the back of an ambulance taking me to the morgue. You could probably cycle to a 4th place finish in the Geezer category before I could learn to take incredible bird photos. Darn sure of that! Guess I should have called it Racing with the “other” German, since you are the original and best. Just amazing…with no recent training you sure rocked it! I was waiting to hear what German dish you ate post race :) just found a brand new bike trail by us…tomorrrow we’ll give it a go! post race – a beer, pretzels, and a Cliff bar. But, being German, I can make a mean rouladen. It’s my favorite. We also eat unseemly amounts of sauerkraut around our house. Beware! You’re not looking older. It’s just a mudpack. We spend big$$$ to have mudpacks to make us look younger. Just wash it off and you’ll look 20 years younger. That’s what they say. 4th place is impressive. You rock. Anyone who even starts that race is a hero in my eyes. It’s got to be one of the most difficult races in West Michigan with all those hills and sandy gravel that looks like quicksand. You were looking strong and happy when I saw you. Congrats! We went to a brewpub in Ada after the race for a quick pint. Getting back in the truck, I got a look at my face in the mirror – I had mud splatters everywhere. Can’t believe John wouldn’t tell me to give my face a quick wipe – looked like I had been dragged behind the truck!